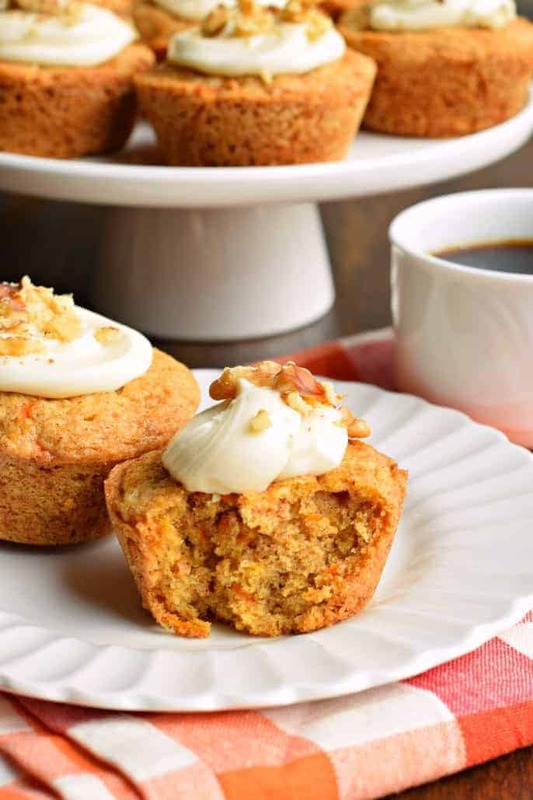 You’re going to love eating these Carrot Cake Muffins for breakfast. Especially since they are topped with a cream cheese frosting and walnuts! It’s that time of year when I want to make carrot cake EVERYTHING. My dad loves carrot cake, and since this is his birthday month, I tend to get nostalgic and want to make all the carrot cake recipes. From this classic carrot cake, to this over the top (but insanely delicious) Carrot Cake Cheesecake Cake, I can’t stop. Today though, how about carrot cake for breakfast. I mean, after all, they are muffins. And muffins are breakfast food. Even when they are topped with a big dollop of cream cheese frosting. Oh wait, I should call it a glaze to make it more breakfast friendly. Yes. 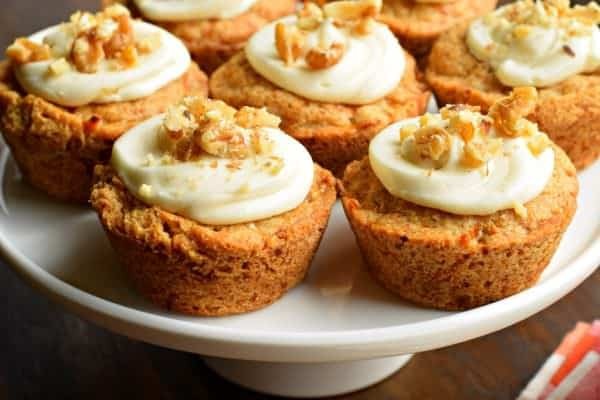 Carrot Cake muffins with a cream cheese glaze. And walnuts. For protein of course! Now that I have devoured this whole batch of muffins, I guess I’ll bake up some of these Carrot Cake Cupcakes next! Spray a muffin tin with baking spray. You don’t need to use liners for these muffins! If your batter is really thick, don’t worry, it should be! Don’t overbeat it. Use a large cookie scoop (I like this one) to portion out your muffin batter so they are even. This recipe makes 10-12 muffins! Let your muffins cool COMPLETELY before adding the glaze! Store muffins in an airtight container in the refrigerator for best results. You’ll want to keep that cream cheese frosting chilled. If you’re skipping the frosting (glaze, I’m sorry), you can store these at room temperature. 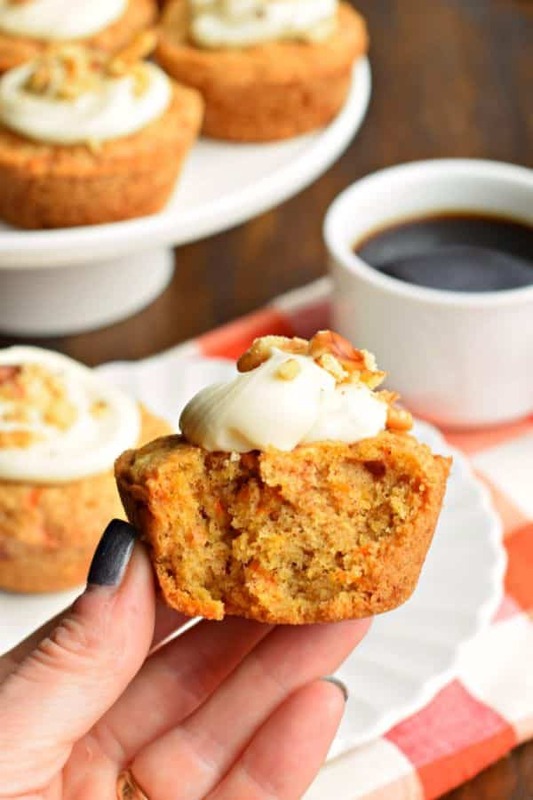 You're going to love eating these Carrot Cake Muffins for breakfast. Especially since they are topped with a cream cheese frosting and walnuts! Preheat oven to 350°F. Spray muffin tin with baking spray. Set aside. In a large bowl, mix the sugar, oil and eggs together. Add in flour, baking soda, baking powder, and cinnamon. Mix until fully combined. Fold in carrots. Using a large cookie scoop, fill muffin tin with batter about 2/3 full each. You should get 10-12 muffins. Bake for 20-24 minutes. Remove from pan and cool completely. For the frosting, beat the butter, cream cheese, vanilla, sugar and heavy cream until smooth and fluffy. Drizzle over each muffin and add a sprinkle of the chopped walnuts. Serve and enjoy! If you’re on the hunt for other unique CARROT CAKE recipes, be sure to check out this Carrot Cake Roll from Dorothy. Her cake roll recipes are top notch! Or maybe you want to try these Carrot Cake Cookies from Maria. 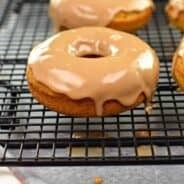 I love that she even added a Cream Cheese glaze to the top! Finally, think outside the box and make a batch of this Carrot Cake Fudge from Jocelyn. How adorable would this be on your Easter dessert table!?! These have been pinned and will have to be re-created ASAP in my house. They’re so pretty and sound so tasty, too! Love Carrot Cake. Love muffins. This one looks like a win/win to me! I love carrot cake and this will be easier than making a cake. Thank you for the recipe. 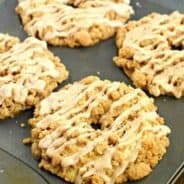 Carrot cake is one of my favorites, so I know I would love these!!! I made these yesterday! Delicious recipe! And that icing… omg to die for. I’m very happy I found your blog! I love to bake, but my family is grown, so I am selective about what I do bake for occasions that come up. I host a group of older musicians every couple of weeks and am expected to serve some kind of refreshment. I found that they seem to really like it when I make muffins and serve them with a pitcher of cold milk, I think because they are not as overboard sweet as cake or cupcakes, and they are easier to eat. 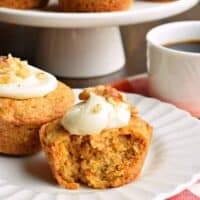 So, as I always try to do something a little different yet special, I searched for “carrot cake muffins” and landed here. I can’t wait to make these carrot muffins for this Thursday! And then I see you have a treasure trove of muffin recipes! I will be back to say how they turned out and also delve deeper into your other recipes! Thanks so much for going to the trouble of posting all these recipes! Well, I tried this carrot cake muffins recipe, and I’m sorry to say I was not happy with it. The muffins would not come out of the muffin tin, in spite of the baking spray, and I could never serve the mangled muffins to guests. I ended up throwing them away, rather angry at the waste of time, energy (I’m old) and ingredients. I could not recommend this recipe to anyone. They did taste fine, but not so spectacular that I will try this again. I was not happy with the result either. I think there was too much sugar and not enough flower. Next time I will try another carrot cake recipe, but I still might make them muffin shaped. 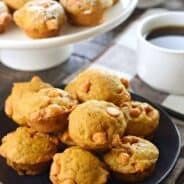 I have made these muffins at least a dozen times since I came across this recipe. Love them..Family and friends always ask me to make them..thanks best muffins ever! I tried your recipe and unfortunately 1 cup graneted sugar is too sweet, I really didn’t like. Sorry about that.